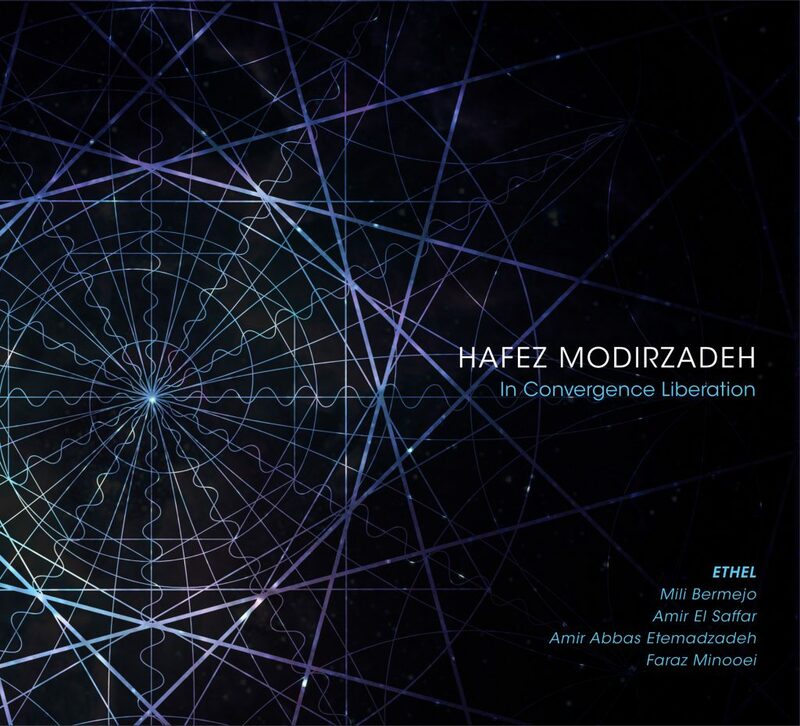 In Convergence Liberation represents the latest step in saxophonist/composer/theorist Hafez Modirzadeh’s thirty-year quest to create a seamless exchange between the world’s musical systems. It follows on the heels of his 2012 release Post Chromodal Out!, which featured a piano retuned to variations of Persian temperament as played by Vijay Iyer that the Los Angeles Times called “thick with inspiration” and the San Jose Mercury News called “visionary”. The new work further explores Modirzadeh’s concept of chromodality, a cross-cultural musical approach that allows for the co-existence between all musical temperaments and sources of inspiration, which Modirzadeh originally derived from his own American jazz and Iranian dastgah heritages. The seven chamber works on In Convergence Liberation intertwine such disparate elements as Persian and Iberian scale-structures, Andalucian poetry, Iraqi maqam practice, as well as the classical string quartet tradition as performed by the acclaimed ETHEL. Argentine-Mexican vocalist Mili Bermejo (vocals) and Iraqi-American Amir ElSaffar (Iraqi santur, vocals and trumpet), singing from Spanish and Arabic sources, and Faraz Minooei (Persian santur), and Amir Abbas Etemadzadeh (Persian daff and tombak) together demonstrate the musical potential to liberate cultural traditions with true universal empathy. A collection of tone poems and song cycles, the works on In Convergence Liberation include La Angustia de los Amantes (Lovers Agony), a Spanish rendition of a poem by the 13th century Persian poet and philosopher Jalāl ad-Dīn Rūmī that utilizes the notion that there is gravity to sound, with tones defined by the freely-moving sigh and swell of human emotion. Utilizing gamelan structures, Tetraspheres involves players going inside tone, creating a musical system of various partials of the harmonic series that liberate music from culturally imposed constraints. Karnā Passages features Modirzadeh on an ancient Persian double-reed instrument: this one hybridized with a bassoon reed and sawed-off trombone bell. Las Orillas del Mar (Seashore Waves) features lyrics from an anonymous Andalucian poet of 14th century Spain. Her haunting message is conveyed with a melody imagined from a Perso-Iberian scale cycle. Number That Moves abstracts motifs from the original notation of the Adagio section of Beethoven’s Piano Sonata no. 26, where the absence of bar-lines shifts perspective towards collective interdependence. In Suite Compost, Modirzadeh disintegrates three centuries of classical string quartet music into an ancestral dialogue for ETHEL’s creative inspiration. By cutting up and reconstituting themes and lines from several dozen existing string quartet compositions and empowering the musicians to transcend the linear, the music of Mozart through Bartok shape-shift into one another, creating a new and fluid approach towards tradition. Finally, Sor Juana is from the poem “Stira Filosfica (Philosophical Satire)” by Mexican poet Juana Ins de la Cruz (1651-1695). Mili Bermejo resurrects the voice of Sor Juana in its original Spanish, using a mode common to both Persian and Andalucian traditions, while Amir El Saffar provides vocal support in Iraqi maqam, reflecting eight centuries of Arab Spain resonating in Sor Juanas colonial Mexico. Modirzadeh received his Masters from University of California at Los Angeles and his Ph.D. in Ethnomusicology from Wesleyan University and is currently a Professor of Creative Music at San Francisco State University. He was twice named a National Endowment for the Arts Jazz Fellow (1989, 1991) and was granted a Fulbright to work with Gnawan and Flamenco musicians in Morocco and Andalucia in 2005-06. Ever restless in seeking new inspiration for his art, he recently spent time in Ghana where he conducted fieldwork in the Ashanti region, traveled to Iran for workshops on the development of a new artistic research group headed by female Persian composers and musicologists, and will be going to Turkey this fall on his second Fulbright to work on adapting a chromodal approach to the Turkish national harmonic system.